I feel like teeth whitening kits are a somewhat sour phrase, I don’t know about anyone else but I’ve had a lot of PR emails in the past for teeth whitening products and I’ve always been a little apprehensive since teeth whitening products can erode enamel and damage the teeth. Despite this, I did actually ask for a teeth whitening kit for Christmas, my teeth have always been on the yellow side anyway no matter how often I brush them, floss and mouthwash. Additionally, I am a smoker (I know I know) so I take extra care to try to avoid nicotine stains. My lovely mum got me this iWhite kit for Christmas and now I’ve fully tested it, I’m here to report back. The iWhite range offers various kits and toothpastes to whiten the teeth, this one is specifically the dark stains one since I smoke as well as drinking a lot of tea and coffee. The packaging to me is actually quite bulky since we have 10 pre-filled trays (enough for five uses), around a quarter of the box is just packaging which does feel unnecessary. I was quite surprised at the price of this as this kit retails for £35.00 which I think is quite a lot. “The new iWhite Dark Stains is designed specifically for the prevention and elimination of dark stains caused by: coffee, tea, tobacco and red wine. Quite a lengthy product description no? As to how this works, rather than sticking anything to your teeth or scrubbing or applying a fluid, the application is actually pretty simple. Each gumshield is pre-filled with the solution so you simply slot one tray over your top set of teeth and one tray over the bottom set of teeth, then gently bite down (not fully) and leave for twenty minutes. The solution doesn’t hurt the teeth at all but I will say it is an uncomfortable twenty minutes, not because of pain or anything but you’re not supposed to swallow the solution so your mouth will fill with saliva and you have to deal with it for twenty minutes. Once you’ve waited then remove and dispose the shields and brush your teeth. The solution does contain tiny little microbeads that dissolve however, I will say these can get stuck between the teeth so I would recommend brushing thoroughly and flossing if needs be since this is a charcoal based solution and you don’t want black smudges on your teeth! So, did this work? Well yes and no. Before using these I did have a nicotine stain and I’m pleased to say that after I’d used all of these my teeth did look whiter and the stain was dramatically reduced. Having said that, although this did make my teeth look slightly whiter the difference was subtle, I did notice it but I definitely didn’t have super white teeth afterwards so don’t expect your teeth to be completely perfectly white as if they’d been bleached because that won’t happen. I do like how these reduce more staining and how they also freshen the breath however, the results didn’t really last long for me and within a few weeks my teeth were back to before. Based on the subtle difference and the lack of permanent improvement (or at least longer than a few weeks) I do think this kit is overpriced. 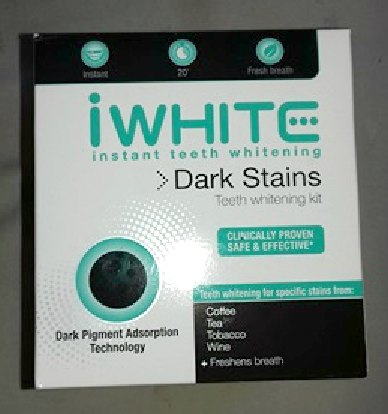 The iWhite Instant Dark Stains Teeth Whitening Kit is available from Boots for £35.00. I hope that you enjoyed this post and if you did please hit the like button, let me know in the comments if you have used any teeth whitening products before and what your experiences were I’d love to know! 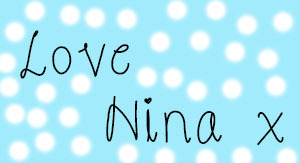 This entry was posted in lifestyle and tagged beauty blog, boots, instant dark stains, iwhite, lucia widdop, ninarossbeauty, teeth whitening kit. Bookmark the permalink. Mine must be naturally a bit more yellow then haha, I did look at Cest strips but they’re hard to get in the UK and are usually around £30 on Amazon.